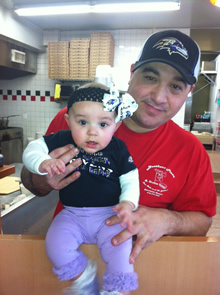 Brother's Pizza II, opened in November 2012, is owned and operated by Italian born and locally raised Andy Illiano. Andy was born in Naples, Italy and raised in Westminster, Maryland. Brother's pizza was first opened in the 1980s in Westminster, Maryland by Andy's father, Pasquale Illiano, where Andy spent much of his childhood learning the recipes and skills to make an old school pizza in our modern times. Now that his father has long retired, Andy takes pride in continuing to offer the excellent quality food using fresh ingredients and family-friendly service that his father began over 30 years ago. Andy enjoys interacting with his customers on a daily basis at his establishment and relishes the fact that many of them will also become friends.